This is a liveblog of the events currently going on near the Egyptian border in the area of Eilat. There's a full map of the area in the 2:55 pm update and a more detailed map in the 3:36 pm update. There are three events. 1. 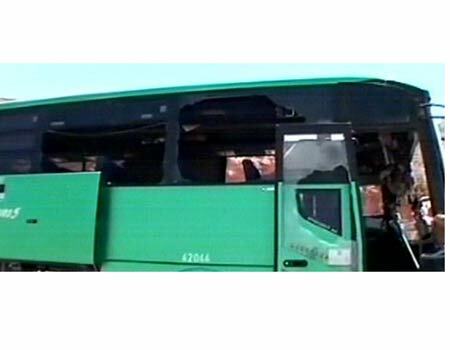 'Palestinian' terrorists shot at an Egged bus - number 392 - from Beer Sheva to Eilat. The driver kept driving and no one on the bus was killed. The bus driver has just told Israel Radio that people wearing Egyptian army uniforms shot at his bus. 23 soldiers who were on the bus. 2. 'Palestinian' terrorists near the Philadelphi corridor shot at a private car. Two children were hit. 3. 'Palestinian' terrorists attacked an IDF patrol in the Philadelphi corridor area. Thus far, 26 wounded people have been brought to Soroka Hospital in Beer Sheva by bus. There is still much confusion as to what happened. I will update when I have more. 'Tens' of wounded. IDF killed all terrorists. Events happened on Route 12 in area. 1 killed, 20 wounded on bus. Five wounded from IED's near Philadelphi. All critical. 25 wounded brought to Yoseftal Hospital in Eilat. Some transferred to Soroka in Beersheva. Egypt denies involvement. 'Palestinians' claim terrorists wore IDF uniforms. No confirmation of that. No group has taken responsibility. Bus was shot at by passing passenger car. Third incident, near Netafim involved shooting at a bus and car. Yoseftal has 25 wounded including 5 critical. IDF says that infiltrators came in through Philadelphi corridor and that there was a warning of a coordinated terror attack although it was not about this specific area. The event has not yet ended. There was a gun battle for quite a while until the terrorists were killed. In the third incident a bus and two cars were hit. People were killed in the cars. We don't know yet how many. IDF spokesman says anti-tank missiles and mortar fire was shot at IDF soldiers in the area but no one was hurt. All of the casualties were in the buses and the private cars. Please recall that Israel is trying to build a fence on its border with Egypt, but much of the area is open. Magen David Adom confirms at least five dead. 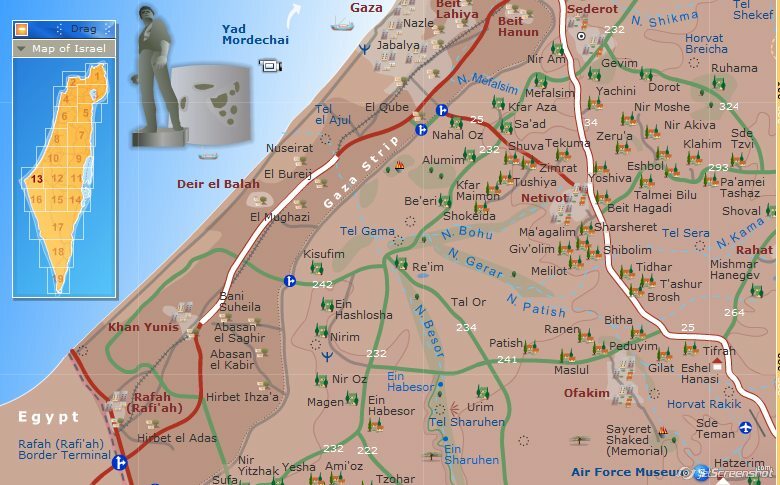 As of now, it's believed that terrorists left Gaza through Philadelphi, crossed into Egypt and then came back across the border into Israel along Route 10 (they didn't say 10 but that's what's on the map) and attacked. IDF says event not yet ended. They cannot say if there are other terrorist cells wandering around the area. There are exchanges of fire near Gaza. Special Yamam terror fighting force also involved and is currently fighting the terrorists (police spokesman says that he thinks that has ended). There may be another attack on the Gaza border. Israel Radio news update says 'tens' wounded - five dead, four of them in private vehicle. The other person was killed on the 392 bus. 2-4 terrorists killed. Police and MDA have raised alert level. Diplomatic sources believe source is Gaza and it shows weak Egyptian hold on Sinai. Driver of private car told Israel Radio correspondent at Yoseftal Hospital in Eilat that he saw soldier in uniform kneel and shoot at his car. This happened on Route 10, which runs along the Egyptian border from the Philadelphi Corridor to Eilat. Egyptians denying any involvement. Claim that no one came in to Israel through Egypt. Take that with a grain of salt as best estimate now is that terrorists went from Gaza to Egypt (Sinai) to Israel using a road called Tzir HaHeth - a road that is shaped like a Hebrew letter Heth (which is like a rectangle with the bottom left open). 26 injured reached Yoseftal on their own - one seriously wounded (apparently from the first bus and he died), the rest light to moderate. 7 people who came to Yoseftal by ambulance were flown by helicopter to Soroka in Beer Sheeva. Medical Association has canceled strike in the two hospitals involved. Hamas deserting command posts out of fear of Israeli reaction. Interviewing someone who was in front of first bus that was shot. There's an Egyptian post from the fence on the right as you head south. He saw someone shooting from that post. His wife and two kids in the car and his wife's sister was in the car behind them. Told the kids to lie down, kept driving and called the police. It happened between two roadblocks (NOTE - This is within the 1949 armistice lines). He says his car was hit five times. The bus behind him was also hit. At the roadblock they already knew about this. No one in his car was hit but that was a miracle - missed daughter's head by a few centimeters. Interviewing someone from first bus. Her children were hit by shrapnell. Five shots hit bus. Told children to duck but they were strapped in and could not really duck. Two children. Finally found you a map. See below. A is Gaza. B is Eilat. Blue line on your left (which is on the right if driving south) is the Egyptian border. Beyond that line is Sinai. Route 10 runs right along that blue line. 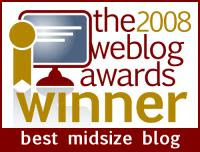 Welcome Ace of Spades readers. Events still not deemed under control. The IDF believes there could still be terror cells hiding in the area waiting to attack. Highways 10 (the blue line above) and 12 are closed by IDF order. There is a battle going on now in the area. More below. Yoseftal Hospital now reporting 29 wounded - 7 of whom were helicoptered to Soroka in Beersheva. The rest are being treated in Yoseftal. The bus included soldiers traveling home on weekend leave. Bus was traveling from Beersheva to Eilat. IDF vehicle hit IED and its passengers were hurt. As you can probably tell, there is still, several hours later, confusion as to what happened. By the way, if you look at the map above, Road 12 runs from Mitzpe Ramon to Eilat. As to that battle, Israel Radio asked military correspondent for details, and she said that the 'red group' is fighting a gun battle. No real details. Just that it's still going on. Welcome Jammie Wearing Fool readers. Israel Radio now saying attack happened on Route 12 20 km north of Eilat (which means after 10 and 12 merge). Sorry you can't see that on the map above. They don't believe Hamas carried out this attack, but Hamas responsible for preventing others from attacking. There was an overturned car where four people were killed - that's four of the five deaths. Car overturned when it was shot. IDF troops coming to rescue were attacked with IED's, mortars and anti-tank missiles. Now confirming that this happened on Route 12 about 20 km north of Eilat. Finally found a clear map of the area that shows where Highway 12 runs along the Egyptian border just north of Eilat. I don't have the scale for it (sorry) and they have not given out the exact location on the news. But here's the map. The other big highway - 90 - runs along the Dead Sea and goes through the Jordan Valley up to the Sea of Galilee and beyond. Hamas responds by warning Israel not to retaliate by attacking it. At this point it is still not sure that Hamas actually carried out the attack. Israel Radio reporting most wounded men in their late teens and 20's (i.e. army age). 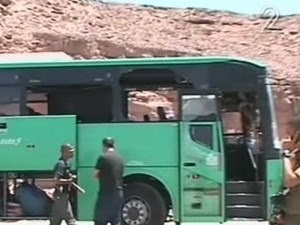 At least five people were reported dead and at least 25 injured in a three-stage terrorist attack along Israel’s border with Egypt on Thursday, which began when terrorists opened fire at an Egged bus traveling on Road 12 near Eilat. The casualties were evacuated to Yoseftal Hospital in Eilat. A number of soldiers were among the casualties. Several minutes later, a number of bombs went off next to an IDF patrol traveling along the border with Egypt. There were also reports of mortar fire from Egypt into Israel. The terrorists apparently then moved on to another spot and fired an anti-tank missile at another vehicle, injuring a number of passengers. 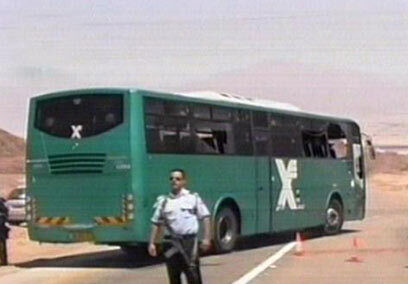 Magen David Adom said that terrorists attacked a bus and a private vehicle 20 kilometers north of the site of the first incident. Paramedics said five people there were mortally wounded in that attack. PMO spokesperson Ofir Gendelman announced on Twitter that three of the terrorists involved in the attack were killed by special forces. “This seems like a coordinated attack,” a senior IDF officer said. There was also speculation that there may have been more than one terror cell coordinating the attacks. Commander of the IDF’s Edom Division Brig.-Gen. Tamir Yidayi arrived at the scene of the bus attack and set up a command post to coordinate efforts to capture the perpetrators. The IDF suspects that the terrorists infiltrated into Israel after crossing into Egypt possible from the Gaza Strip. On Sunday, the Egyptian Military launched a massive operation to capture terrorist cells operating in the Sinai. Due to concern that terrorists had infiltrated into Israel from Egypt, security officers in Israeli communities along the border were ordered to raise the level of alert and to tell residents to remain inside their home. Israel Radio just reported that most of the wounded are soldiers from Eilat. 21 wounded released. 1 person left in Yoseftal, 7 in Soroka - 1 serious, 1 moderate, 5 light. Six people killed. One in one place and five in other place. Israel Radio ending special broadcast (which is continuous news after a terror attack) and will return to regular programming. Business news after 4:00 news and daily roundup at 5:00 pm. Most wounded came from bus. Report of seeing soldier wearing Egyptian uniform opening fire has been confirmed by several witnesses. Roads 10 and 12 closed. IDF believes terrorists came from Gaza via Sinai. Ehud Barak said this shows Egyptians don't control the area. The Egyptians are searching the area now and reject report that there was firing from Egypt. Israel Radio just announced that there are seven people dead - five men and two women. The first incident started at 12:04 pm - about four hours ago. It started near Netafim Junction. 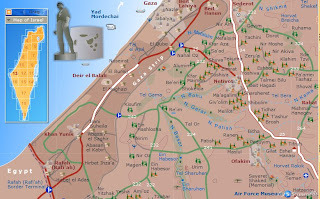 The terrorists left Gaza using the Heth road discussed above, prepared and then attacked. IDF believes Hamas did not carry out this attack and that it has no interest in inflaming the region right now. Neither does the PA. IDF views Hamas as responsible for security on its side of the border. If another organization carried this out, it may mean that Hamas is losing control. By the way, Israel Radio went back to the special broadcast. They're now eating into the business news time. Here are some pictures of one of the buses that was shot. IDF now reporting that it has killed seven terrorists. feed the terrorists to the sharks after they have been questioned. treat these terrorists as they deserve to be treated, as fish bait. Two of the killed were children. Aged 4 and 6. I'm hoping that you can help with some information. What is the current status of the MFO with regard to the multiple attacks on Israel from Egypt this morning? Are MFO personnel and installations safe? Has the recent Egyptian police activity impacted the MFO at all? The time for IAF targeted air strikes is over. Just letting you guys know, Another man Got killed about an hour ago !! In another attack wile Ehud Barak and the Chief of Staff Beni Ganz Were Interviewing for The israeli TV. How much longer can Israel put up with this crap?! (Excuse my language) We have a jihadi sympathizer in the Oval Office, and these savages are feeling freer to come out in the open. Enough already.